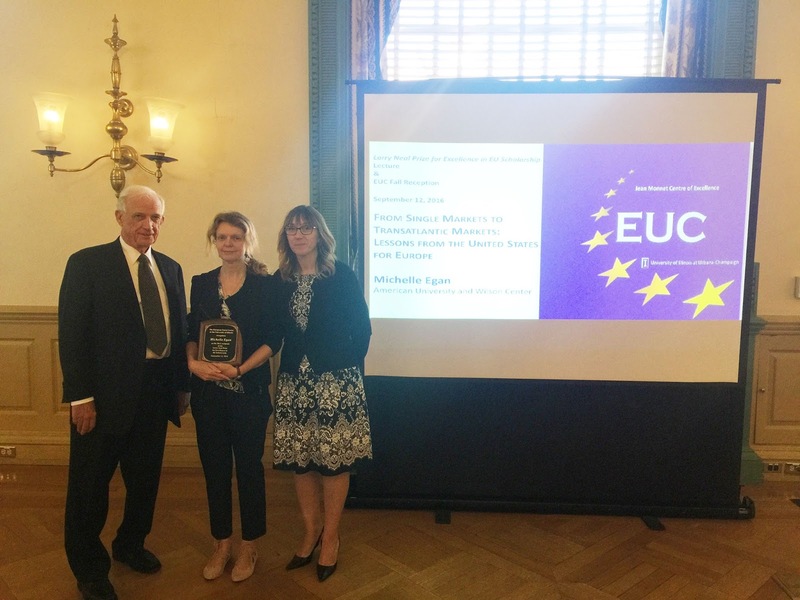 Larry Neal Prize for Excellence in EU Scholarship Lecture: "From Single Markets to Transatlantic Markets: Lessons from the United States for Europe"
For its opening lecture this year, the European Union Center at the University of Illinois hosted Michelle Egan, Professor and Chair at the School of International Service, at the American University in Washington D.C.
Egan was the 2015 recipient of the Larry Neal Prize for Excellence in EU Studies; this award was initiated in honor of Professor Emeritus of Economics Larry Neal, the founding director of the European Union Center at the University of Illinois, to recognize excellent research conducted by affiliated faculty of the EU Centers located throughout the United States and Canada. Professor Egan offered an overview of similarities and differences between the EU and the US, such as their evolution and the comparable path they are following in their unity-building process. Her lecture shed lights on current difficulties in international negotiations, the stance of the two actors, and their internal struggles inevitably casting shadows on the international stage. The EU is working through an integration process that the US already experienced in the 19th century. At that time, new territories had to be included in a common market under common rules. In the 19th century, the US Federal Government had to support states that had hard times keeping pace with financial requirements (Pennsylvania). In the 21st century, it is the EU's turn to support financially weaker states (e.g. Greece). At the same time, differences between the US and EU exist and must be recognized. Regulatory integration is required in the EU with full acceptance of the acquis by new Member States; higher independence at a state-level is assured in the US. The difference in distribution of competences can be understood by observing the opposite perspective as well, as Federal-owned territories in the US cover a surface that would be the equivalent of multiple Member States in the EU. The idea of independence and sovereignty is differently shaped in the EU and the US. Still, these ideas lead to similar conclusions, and fragmentation results in a decisive way for the outcomes of international negotiation and the issues being negotiated. The 4 year long negotiation of a moribund Transatlantic Trade and Investment Partnership is an example of irreconcilable differences leveraging on circumstances created through the process of integration. The federal/state level competence in the US, as well as the Supranational/National competence in the EU create a web of bureaucracy and conflict on rules and regulations. Issues, such as regulation of professions and authorizations or taxations, move between multiple layers and make the finalization of such a broad and comprehensive agreement nearly impossible. At the end of her lecture, Professor Egan received the prestigious Larry Neal Prize for Excellence in EU Studies from Professor Emeritus of Economics Larry Neal, the founding director of the European Union Center at the University of Illinois, in recognition of the excellence of her research among the affiliated faculty of the EU Centers in North America. The video of the lecture can be viewed on Media Space Illinois.